There was a period of time when there were only 13 states in the United States and they were under the operation of the British. These American History 13 Colonies were also known as British America. It wasn’t until the Treaty of Paris was recognized that the 13 states were given their independence from Great Britain and became the United States of America. In 1775, the British colonies rebelled against the British rule. A government was formed and soon after, declaration of independence was given in 1776 on the holiday that is now known as Fourth of July. The first 13 states to be founded were between 1607 and 1733, starting from Virginia to Georgia. There were also some other colonies established in other parts of North American and in the West Indies. The first permanent settlement in North America was the English colony at Jamestown, in 1607, in what is now Virginia. John Smith and company had come to stay. The Pilgrims followed, in 1620, and set up a colony at Plymouth, in what is now Massachusetts. By this time, the English colonies numbered 13. They were Massachusetts, New Hampshire, Connecticut, Rhode Island, New York, New Jersey, Pennsylvania, Maryland, Delaware, Virginia, North Carolina, South Carolina, and Georgia. The New England Colonies were New Hampshire, Massachusetts, Rhode Island, and Connecticut. These were known for being rich in forests and fur trapping. Harbors were located throughout the region. The area was not known for good farmland. Therefore, the farms were small, mainly to provide food for individual families. New England flourished instead of fishing, shipbuilding, lumbering, and fur trading along with trading goods with Europe. The Middle Colonies were New York, New Jersey, Pennsylvania, and Delaware. This area was excellent for farming and included natural harbors. Farmers grew grain and raised livestock. The Middle Colonies also practiced trade like New England, but typically they were trading raw materials for manufactured items. 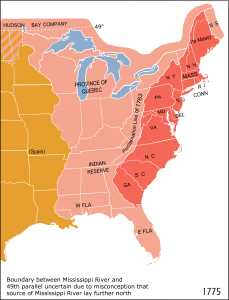 The Southern Colony (the Carolina colony) was a territory that stretched south from Virginia to Florida and west to the Pacific Ocean, was much less cosmopolitan. In its northern half, hardscrabble farmers eked out a living. In its southern half, planters presided over vast estates that produced corn, lumber, beef and pork, and–starting in the 1690s–rice. These Carolinians had close ties to the English planter colony on the Caribbean island of Barbados, which relied heavily on African slave labor, and many were involved in the slave trade themselves. As a result, slavery played an important role in the development of the Carolina colony. The Dutch West India Company had settled New York area as early as 1614. It was known as New Amsterdam and was a self-governing a state until it was lost to King Charles II. It was given to his brother, the Duke of York and renamed New York in his honor. New York was converted into a proprietary colony, until in 1685, when it became a royal colony.